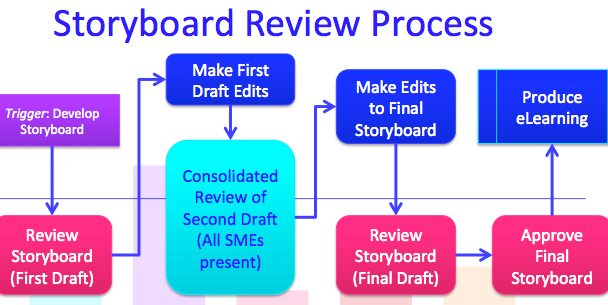 A consolidated review of the storyboard is a critical step in the development process. ADDIE stands for Analysis, Design, Develop, Implement and Evaluate. It’s a common model for developing training and I mostly follow it. But beyond ADDIE, there are some details I think clients and other instructional designers might want to know. I created this video to explain my development process. I wanted it to be colourful, engaging and informative. I also wanted to give potential clients a sample of my voice. I have an unfair advantage. I do it all: analysis, design, develop, write, narrate, produce. When you have a learning need, wouldn’t you like one contractor who just gets it done? This video is an example of what I do. This is also an example of how effective a simple, narrated PowerPoint presentation can be. That’s all this is. What kind of eLearning do you need?